Vice Chairman of Hanoi People's Committee Nguyen Van Suu held a meeting with Governor of Bratislava region Juraj Droba in Hanoi, on March 20, during which the two sides discussed the cooperation potential between Hanoi and Bratislava, particularly in the tourism sector. 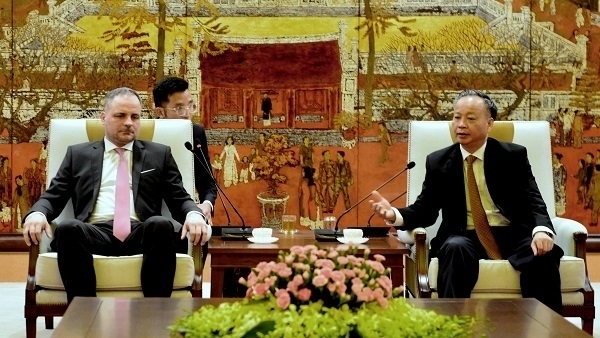 The Bratislava regional governor said that Slovakia and Bratislava have paid great attention to the socio-economic achievements of Vietnam over the past few years and also see the cooperation potential for boosting their bilateral relations in various areas. Juraj Droba noted that his visit to Hanoi aimed to establish a framework to strengthen the relations between the two localities, particularly in the tourism sector. He also suggested the exchange of students following 6-12 month-courses in order to promote cultural exchanges. 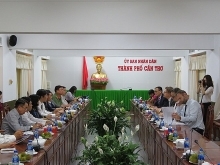 Vice Chairman of Hanoi People's Committee Nguyen Van Suu agreed with the suggestions made by Juraj Droba, adding that the Deputy Prime Minister of Slovakia visited Vietnam and Hanoi in 2017 which contributed to fostering the cooperation between localities of the two countries. Suu also emphasised the necessity of expanding cooperation with the Bratislava region in the areas of economics, culture, society, tourism and urban development as Hanoi has a large population of over 10 million and rapid urbanization. He proposed the signing of a Memorandum of Understanding between the two sides as a basis for closer cooperation in the future.